Two teams that suffered losing records a year ago will battle for a spot in the Class 5A state championship game. St. Thomas Aquinas, which was 3-7 last year, reached the 5A semifinals by beating Bonner Springs and Leavenworth in the first two rounds of the playoffs. With former Hutchinson coach Randy Dreiling leading the way, the Saints have been one of the best 5A teams in the East all season long. But Aquinas is battling injuries in the backfield, including 1,000-yard rusher James Cosentino who was lost for the season in Week 9. In his absence, Kyle Bollig ran for 129 yards and a touchdown during the win over Leavenworth. Bollig also rushed for 138 yards in the first-round win over Bonner Springs. Karter Odermann passed for 82 yards and a touchdown, while rushing for 84 yards and a touchdown. Shawnee Heights, which finished 4-6 last year, is in the 5A semifinals for the first time in school history. The T-Birds opened the season with a 1-4 record, but they enter this matchup on a six-game winning streak. Three of their losses resulted in a margin of three points or less. Shawnee Heights is coming off a 34-14 win over Pittsburg. Running back Tony Barksdale rushed for 158 yards and five touchdowns during the win over the Purple Dragons. He now has 1,724 yards and 27 scores on the season. Aquinas fell 31-21 to Pittsburg on Oct. 31. The Golden Eagles have dominated their competition and seem destined for a Class 5A state championship. Bishop Carroll has scored new fewer than 37 points in a game and has allowed no more than 15. The Eagles’ closest margin of victory was 29 points in the season opener against Wichita Northwest. Carroll opened the playoffs with lopsided wins over Goddard and Wichita Heights. Eagles running back Denzel Goolsby has rushed for almost 1,400 yards. Quarterback Colton Howell has passed for almost 1,100 yards while rushing for 550. Howell rushed for four touchdowns and passed for three more scores in the win over Wichita Heights last week. The Salina South Cougars are on a five-game winning streak since falling 45-14 to Derby on Oct. 10. 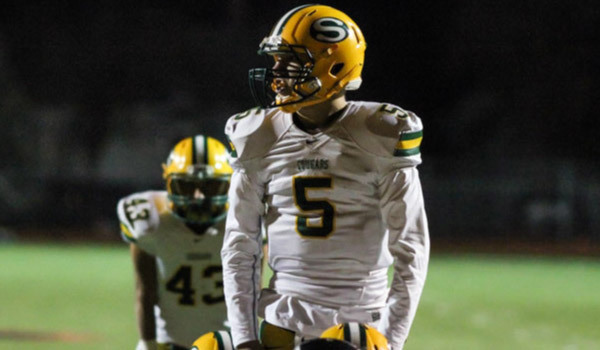 Salina South is led by quarterback Dalton Wassenberg, who has passed for 1,846 yards and 25 touchdowns with only six interceptions. Dylan Becker has more than 1,000 yards receiving for the Cougars. The two connected on a pair of touchdowns last week in South’s 49-28 win over Maize South. Salina South eliminated Bishop Carroll 21-19 last year in the state quarterfinals. It remains the Golden Eagles only loss in their past 35 games.